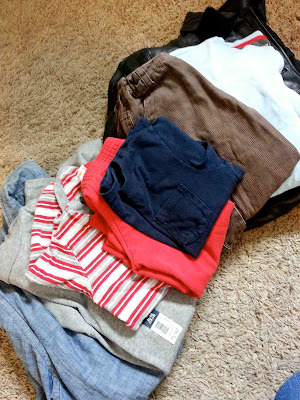 I spent last week tackling my upcycle clothing pile, which was getting too big. I selected about eight pieces of clothing that needed to be turned into something new, and worked my magic. One of those articles of clothing was a gray turtleneck that was never worn, but was in great condition. 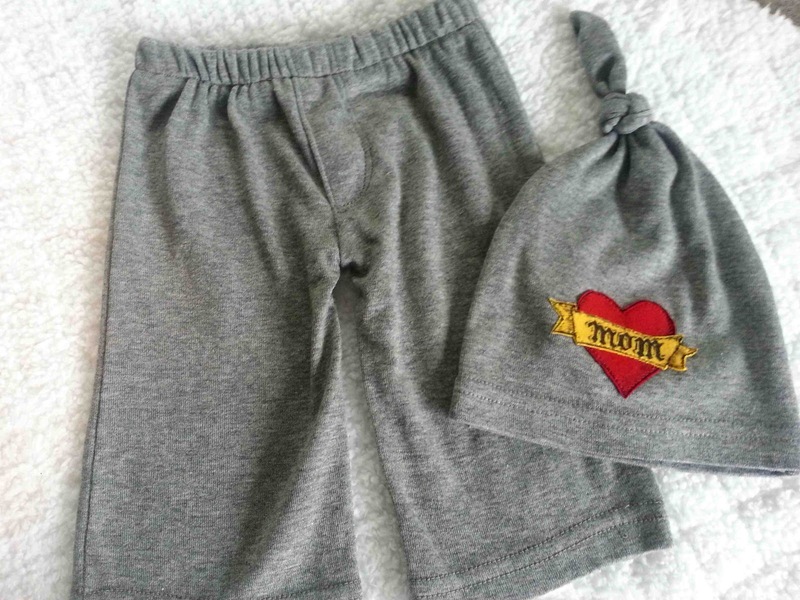 It became a new pair of baby pants, which happen to be one of my favorite little things for baby boys, and an adorable top knot hat with a Mom Tattoo Applique (another of my favorite things). For the hat, I printed off Prudent Baby's Top Knot Hat Pattern. I aligned the original hem of the turtle neck, with the hem line on the pattern. 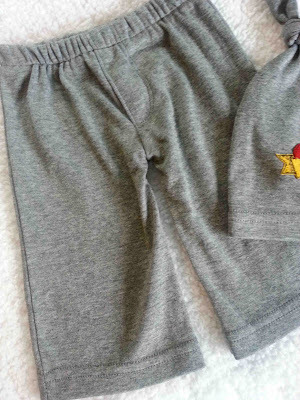 Cut out the hat, leaving the side seams of the turtle neck intact for the baby pants. I followed her instructions, minus the cuff on the hat, and the hat was finished in no time flat. 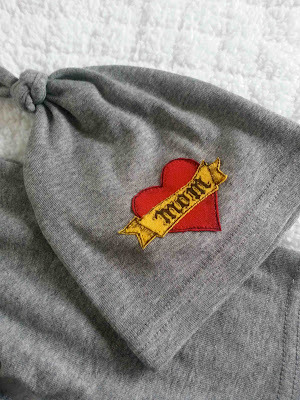 Then, just to dress it up a bit, I added a small Mom Heart Tattoo Applique. I love it so much more than I ever did the turtle neck. 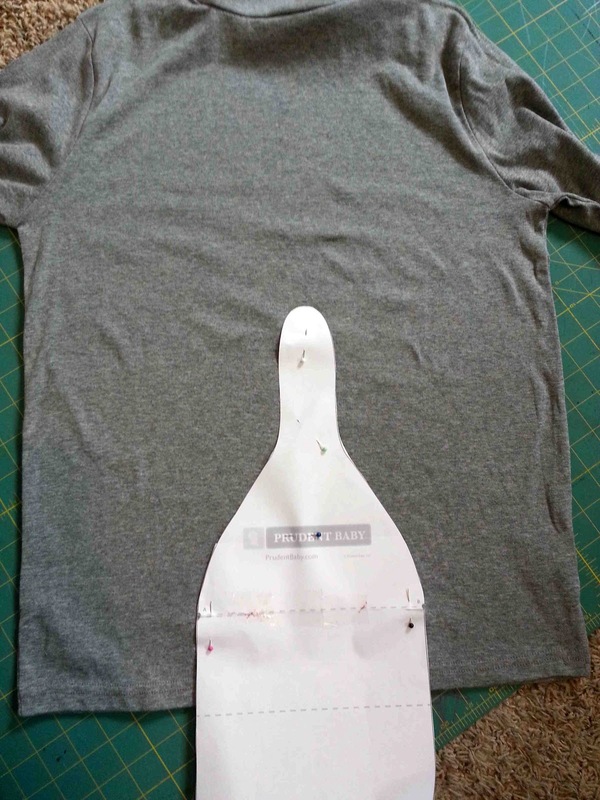 As I mentioned, I preserved the side seams of the shirt, and cut out my infant pants using the existing hem as well. I added a faux fly, crotch and leg seams, and the casing, and these were done in minutes also. So easy. I'm thinking that I need to make at least one more pair of these. Do you want a tutorial? 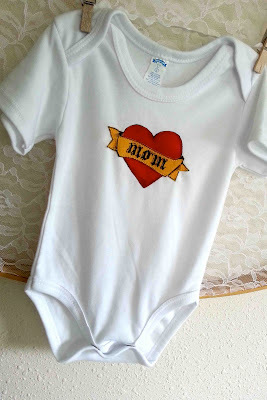 Then, just for good measure, I whipped up a Mom Tattoo appliqued body suit to complete the look. You can find my PDF file applique template here. Thanks for reading, and I have more upcycled goodness to come. It was a productive week. Can't wait to see a little one in that cute outfit! Super!Very good job!I love recycling too!